A stronger than expected U.S. March payrolls report might help ease concerns after a light showing in February. Jobs growth of 196,000 and strong wage gains appeared to help give stocks an early lift. (Friday Market Open) That sound you’re hearing might be a sigh of relief from investors reacting to this morning’s monthly payrolls report. After a weak showing in February that raised fears of an economic slowdown, job creation bounced back in a big way with 196,000 jobs added by the U.S. economy in March. That was about 20,000 above expectations, and way above revised growth of 33,000 in February. What we’re seeing here is a revergence to the mean in terms of average employment numbers, and that’s reassuring. With the March number in hand and job growth back on a more healthy pace, the February number might now be chalked up to the after-effects of the government shutdown and bad winter weather. The government said job growth over the last three months has averaged 180,000, and that’s thanks to strong growth in January and again in March. Average hourly wages grew 3.2% year-over-year last month, another sign of possible economic strength, while the overall unemployment rate stayed at 3.8%, near 50-year lows. Inflation has been a non-starter lately, so the better than 3% wage growth isn’t likely to get many people worried about potential rising prices that sometimes go along with higher wages. With the jobs data in hand, stocks added to earlier gains in pre-market trading. If we’d gotten another report like February’s, it conceivably might have weighed on the market. Still, one thing to potentially worry about today is a possible “Friday fade,” where investors see a good number, decide jobs growth isn’t something to worry about, and then go back to worrying about other things. If you want to find imperfections in today’s data, it might be in the type of jobs created. While business and professional services and health care led the gains—which we’ve seen most of the year and looks great—manufacturing and construction again showed little change, the government said, though 16,000 construction jobs did get added. Those are areas many analysts look for when they seek signs of economic strength, but they’ve been a bit quiet the last two months. Restaurants and bars, along with construction, all had weak growth in February likely due in part to weather, but only restaurants and bars bounced back as temperatures warmed in March. That could be something to keep our eye on, though it’s not worth worrying about too much. 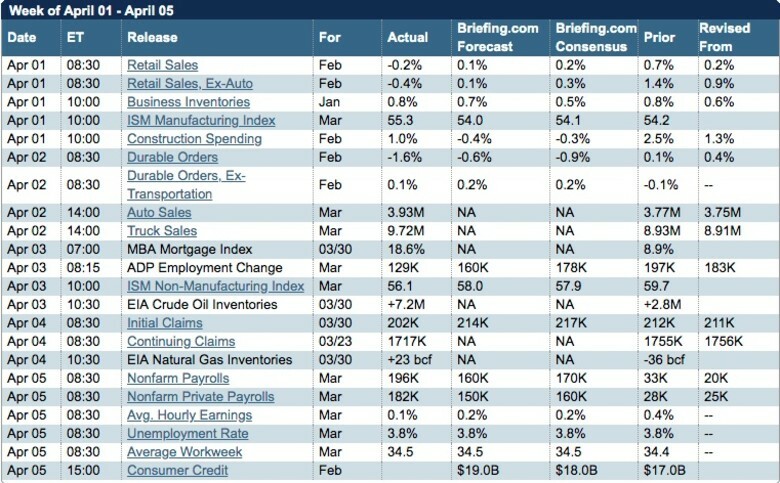 Going into the report, a lot of focus had been on the February number and what it might mean for the economy. When you combine weak jobs growth with some of the low inflation and sluggish retail sales data seen recently, it appeared to send signals about possible underlying consumer weakness. The stock market struggled in early March as investors wrestled with the February jobs data. Since then, economic data have improved, but that ominous February jobs reading wasn’t far from many investors’ minds. Today’s report could mean one less worry. The market has seemed a bit like an eager dog straining on a leash this week. 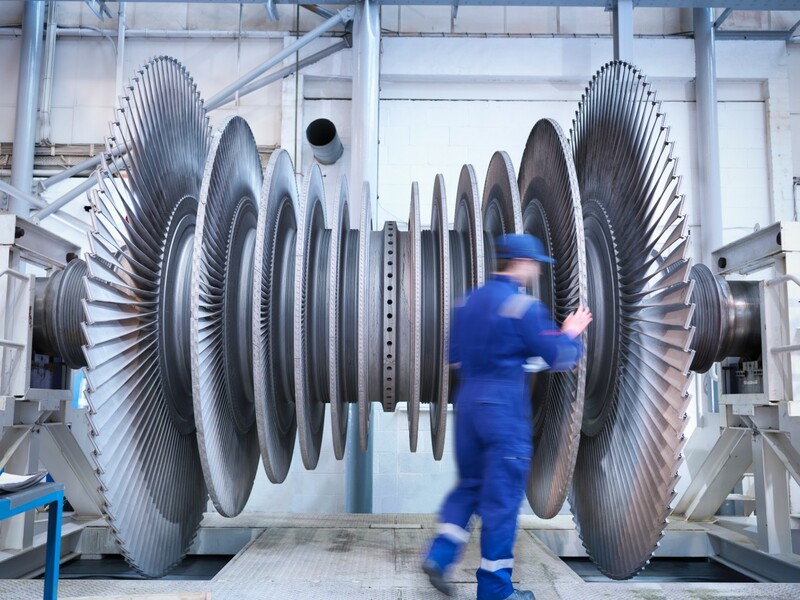 Excitement about the potential completion of a trade deal between the United States and China has helped provide forward momentum to continue the enthusiasm from Monday’s strong manufacturing data. But there does seem to be a leash keeping the market from really going gangbusters. One part of that could be some less-than-stellar economic data this week on U.S. durable goods orders, domestic private-sector payrolls, and German industrial orders. But it’s also possible that investors and traders have kept their optimism in check given the uncertainty ahead of today’s jobs report. And the fact of the S&P 500 (SPX) nearing an all-time high could be acting as a weight of its own, as the market doesn’t have a huge catalyst to move dramatically higher. Of the two main causes for worry about global economic growth—the U.S.-China trade war and Britain’s exit from the European Union—it’s a trade deal that seems to be the closest to becoming a catalyst for a rise in stocks. However, it’s also arguable that much of the optimism for a deal has already been priced into the market, as expectations of a resolution have been one of the key drivers for this year’s solid comeback after the market tanked late last year. On Thursday, investors continued to look for developments on the trade front, as President Trump was scheduled to meet with China’s top trade negotiator after the market closed. With sentiment leaning bullish, the SPX continued advancing toward its record Thursday, posting its best close so far this year. The trade meeting ended without too many new details, but stocks moved mostly higher overnight in Europe and Asia. The Dow Jones Industrial Average ($DJI) also gained yesterday, led by a nearly 2.9% rise in shares of Boeing (BA) despite Ethiopia’s transport minister saying the crew in the deadly crash last month of a 737 Max jet made by BA had repeatedly performed procedures provided by the company but still couldn’t control the plane. The company’s shares appeared to get some lift after Barron’s highlighted a tweet by BA’s CEO about a software update performing safely in a demo flight. Bloomberg reported that the company’s shares gained ground as optimism about a trade deal helped shares shrug off the latest developments on the crash. In other corporate news, Tesla’s (TSLA) shares fell more than 8% Thursday after the automaker disappointed investors by reporting a bigger-than-expected drop in auto sales. The roughly 63,000 deliveries fell short of what analysts had been expecting. Eye on the Greenback: The U.S. dollar (candlestick) has been climbing vs. other currencies, though it leveled off this week. It’s not far from its 2019 highs thanks in part to some strong U.S. data and concerns about Brexit. Meanwhile, gold (purple line) has been descending, which often happens when the dollar gains ground. 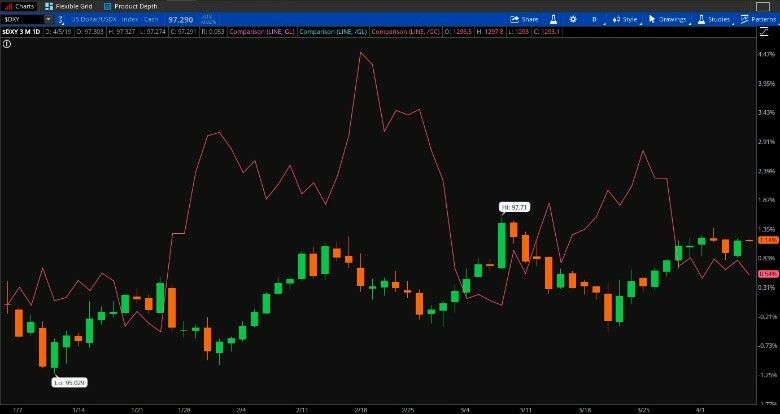 Data Sources: ICE, CME Group.Chart source: The thinkorswim® platform from TD Ameritrade. For illustrative purposes only. Past performance does not guarantee future results. Sentiment Data on Tap: Speaking of the U.S. consumer, which drives a huge portion of the domestic and global economies, investors are scheduled to get a reading on consumer sentiment for April from the University of Michigan next week. The last reading, for March, increased from February’s number. “Rising incomes were accompanied by lower expected year-ahead inflation rates, resulting in more favorable real income expectations,” the university said then. “Moreover, all income groups voiced more favorable growth prospects for the overall economy.” It could be interesting to see if consumer sentiment for April continues to improve. Cain Able? On Thursday, President Trump said he had recommended former Republican presidential candidate and pizza chain chief executive Herman Cain for a Fed board seat. The news comes after Trump has expressed displeasure with Fed Chairman Jerome Powell after a series of interest rate hikes. But as CNBC points out, Cain may not end up being as dovish as the president might wish, noting a 2014 tweet where Cain said the central bank “can't keep the economy running on the fumes of artificially low interest rates forever.” For now, though, the Fed seems committed to a dovish policy as inflation remains muted.